The annual North American Intel Solutions Summit is underway in Dallas, TX and Logic Supply Engineers Hans Brakeley and Casey Atherton are on hand to meet with fellow Intel Partners as well as hardware and software manufacturers from across the country. It would be impossible for us to share everything they’ve had a chance to see and do at ISS 2015 so far, but here are a few highlights. At the main showcase Hans and Casey were able to meet with a number of our own hardware partners, including representatives from Mitac, to discuss upcoming projects and chat about where the hardware industry is headed. 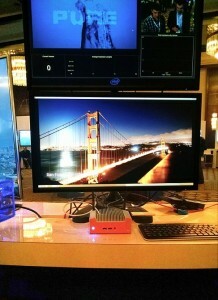 Our new ML100 system was set up at the showcase, running Intel’s Retail Client Management (Intel RCM) software. Time to explore was limited on the first day of the show, but Hans and Casey are looking forward to visiting with more attendees over the next couple of days. We also got a taste of Intel’s new Wind River® Mobile Technology Showcase. The high-tech big rig was decked out to show off how Intel’s Wind River technology aims to help developers create the next generation of intelligent gateways for the Internet of Things. The exhibit was a popular attraction, and not just for the neighboring lunch trucks. The opening night Intel Partner reception featured the annual awards ceremony held at ISS each year. Logic Supply was honored to be named a finalist for Intel’s Partner of the Year award in a pair of categories, and Hans and Casey were treated to presentations about the evolution of channel partnerships with Intel, including insights from CRN’s Robert Faletra. 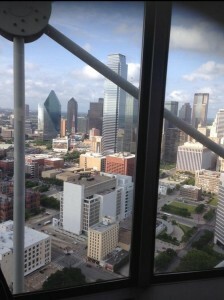 The event was held at Downtown Dallas’ Reunion Tower which offered great views of the city. We look forward to sharing more from Dallas as the Intel Solutions Summit rolls on through Thursday.